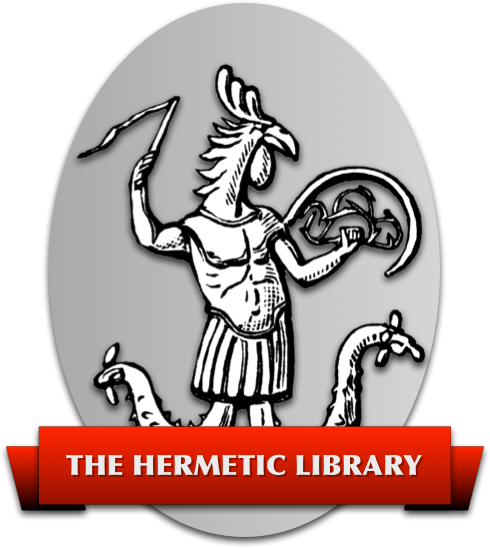 The term “hermetic”, or “hermeticism”, is one that gets used a lot in esoteric study. There’s several meanings for this term, and there’s oppositional terms. Inspired by the possibility for a project recently, I thought that one of the first things I would do is to outline my own thinking about the term and how I use it. I wanted to do this so that I could think about the scope of what a project focused on hermeticism or using a hermetic viewpoint would look like. This is not so much meant to be a serious treatise on the topic, but rather an exploration of my current thoughts and ideas. This is more of an exploration than an essay, a marker at the beginning of a journey to help me see where I was when some point down the road I look back. The term hermetic is related to Hermes Trimegistus, the thrice-great. In fact, the late Latin term hermeticus is as much to say alchemical, and is derived from the name Hermes Trimegistus see,amzn,amzn. This is the hellenic Hermes-Thoth and, also like Ganesha being the scribe of the Mahabharata amzn, is an archetypal magico-religious figure. You know, one of the earliest references may not be to thrice-great but rather to triple-hero. This makes me instantly think of Triptolemos, literally threefold warrior, a demi-god in the Eleusinian mysteries amzn,amzn who was sometimes priest of Demeter, sometimes inventor of the plow (which is then a kenning or synecdoche for agriculture). Also, in the tripartite social structure of indo-european society amzn, the semi-divine hero often fulfilled all three categories, being magician-king and warrior-poet and farmer-laborer combined. For example, Triptolemos already mentioned; and Orpheus who’s magical music commanded even the rocks and trees to his bidding, who was one of the warrior-poets of the Argos in the Odyssey amzn, and who cursed the bees of the bee-keeper. These semi-divine heroes walked the line between human and divine with the task of both upholding and challenging the world-order amzn,amzn. Also, it seems to me that to pass into life and through the two veils of the tree of life, that of Paroketh and of the Abyss, is to be thrice-born. So, the term hermetic means related to Hermes Trismegistus or the many materials he was supposed to have written on the topics of alchemy and magic. The term hermetic is also a more general term for the overall syncretic tradition that is evidenced in much of the specific Western esoteric traditions. In other words, the term hermetic includes those parts of the western tradition which use the hermetic modality in their thoughts and works. These include a cornucopia of what often seem to be wild-eyed, fridge, and alternative groups throughout history: Alchemists, Rosicrucians, esoteric Christians, Kabbalists, Theosophical and the Illuminist or Perfectibilist currents within Freemasonry. This current continues in many of the modern occult and esoteric traditions, especially with so many having some connection or exposure to the materials from the Hermetic Order of the Golden Dawn, a true nexus point in the Western tradition. This is to say that the hermetic philosophy is a kind scientific illuminism, which further term is familiar to those who’ve read Crowley amzn. Remember Clarke’s Third Law see about any sufficiently advanced technology. But, also consider, Niven’s Law or Heterodyne’s rephrase, that any sufficiently advanced or analysed magic will appear as technology. This hermetic modality is a philosophy that attempts to relate, perhaps universalize, magico-religious principles. To the extent that this universalization denatures the originals, I think that’s not a good thing; but to the extent that this philosophy is one that normalizes the diversity of human understanding of the human relationship to the more-than-human, in essence facilitating the conversation between the blind men about the elephant, there’s enormous value. Notice that this introduces the oppositional relationship between hermetic and mosaic. I suppose it’s quite possible and reasonable to see Campbell as the source from which I started to use the terms hermetic and mosaic as meaning symbolic and literal. I don’t know now where or when I started to use these terms, so it seems as likely as any. These two oppositional terms also for me have connotations of fun vs. boring as well as flexible vs. uptight, permissive vs. strict. Beginning to become more poetic in my analysis, I also see this opposition as curious vs. close-minded and multivalent vs. monovalent and polysemous vs. synonymous. Maybe even to go overboard I also think of many other oppositions when using hermetic and mosaic: nominalist vs. realist, existential vs. essential, freedom vs. slavery, existentialist vs. positivist, empiricist vs. realist, allegorical vs. tautegorical, antinomian vs. legalist. I could go on and on. Clearly, I have some value judgements about this pair, and have a bias toward the symbolic, mythical side. I feel that the hermetic thinker is one that is curious and skeptical, one looking to test propositions instead of blindly accepting them. The discipline of symbolic thinking seems to me to be one that is necessary in the face of a modern world where propaganda and persuasion, in the form of not just political discourse but also in marketing and advertising, seem the most common styles of communication. Many times I find myself baffled by people who’s mode of thinking is mosaic, and most likely they by me. To make my string of comparisons less pejorative to the literal, perhaps these can also be seen as meaning, to hint at the Tantric, expansive vs contractive, and thus akin to the Alchemical solve et coagula. Following this thought, these two form an functional set necessary for change to occur, just as the action of solve et coagula results in transmutation. This is the tug of war between the Asuras and Devas that results in the churning of the waters of the world through the action of the Axis Mundi so beautifully represented at Angkor Wat amzn. This is the analysis and synthesis of the ancient dialectic, the thesis and antithesis of Hegel leading to synthesis, and the dialogism of Bakhtin amzn. Seen this way, these are the yin-yang, the unity of duality, and here we’re now back full-circle to ideas of Gnosticism, Neo-Platonism and more, which can be seen as coming under the umbrella of Hermeticism; thus, the opposition is contained by one of the polar pairs, just as the yin contains the yang. It is to me no small irony that another meaning for hermetic, which I’m not talking about except for here, is to be tightly sealed or impervious to outside influence (although also derived from Hermes Trimegistus) see. Because this seems to me to be generally the opposite of the meaning I’m exploring. Hermetic is a one word oxymoron. But, then again, here’s the unity in duality. And, indeed the universalist movements within the overall hermetic umbrella are a form of this contractive, simplifying, unifying effort even within what I take most often to be the opposite. This opposition-within-position is completely non-Aristotelean, and warms the cockles of my evil little black heart. This is philosophical wabi-sabi. Put that in your pipes and smoke it, you frakkin’ Randroids! I’m not sure where I first heard the phrase hermetic drift but it’s a great description of the kind of lateral surfing through correspondences that often happens when thinking about esoteric topics, ideas and terms. Connections can be made between things which are symbolic, even poetic; not based necessarily on logic or science. The risk seems to me that this can become a trap in Chapel Perilous or a dinner-date with Choronzon (Watch out for those meat pies, Saturninus! see). There’s a term for the mania of seeing connections and patterns everywhere in meaningless or random data, apophenia. It is possible to get lost in Chapel Perilous and go insane unless one is prepared. I’m not saying hermetic drift is a Bad Thing™. I’m just saying it’s a double-edged sword, so be conscious of where you’re swingin’ that thang. Some of the worst of the new age is an overbearing universalism, which seems to me to even become appropriation. This denaturing of difference is the worst kind of old-school anthropology, like the Romans trooping around always engaged in a procrustean project to transform others into the familiar: “Oh, when you say Odin, you mean Mercury! Why didn’t you say so?” This seems to be one of the major projects, and thus I think failings, of movements like Theosophy; this essentially anti-intellectual, anti-academic haze that everything is the same and differences are mistakes in people’s understanding of their own traditions; it’s hierarchically arranged so that the so-called expert always knows better than the actual practitioners. This kind of expertise is really just another hall of mirrors, the echo chamber for the expert to see only what they are already conscious of in themselves everywhere else see. That kind of expert might as well be a brain in a jar never really engaging beyond their own illusions of self. The old Golden Dawn was really uptight about the use of the inverse pentacle. Seeing the pentacle as the five elements, with spirit being the point either up or down; the inverse pentacle had spirit beneath the rest of the elements. The triumph of matter over spirit could be seen as being lost in the world of illusion. However, it’s also possible to see the inverse pentacle as being the process of manifestation, and thus an appropriate pair with the upright pentacle; this is the lightning path bringing manifestation down and the snake wending back up the tree of life. In a pyramidical arrangement, the elements form the base with spirit as the apex. The capstone of an ancient pyramid was said to have been golden, and seems like a better representation of the perfect ashlar. This perfect ashlar is not cubical but rather, like the Benben, representative of the primeval mound that rose from the primordial waters before the beginning of time, sacred as the place where the first rays of the sun-disk fell to create the universe. In the Amarna period, the Aten disk’s rays were hands extended giving the symbol of life, the ankh. I am a child of earth and starry heaven. But my race is of the stars, as you well know. I have come here guided by the gods themselves. I am parched and dying of thirst. Let me drink from the well of memory. “Exec #1: Item six on the agenda: “The Meaning of Life” Now, uh, Harry, you’ve had some thoughts on this. Exec #2: Yeah, I’ve had a team working on this over the past few weeks, and what we’ve come up with can be reduced to two fundamental concepts. One: People aren’t wearing enough hats. Two: Matter is energy. In the universe there are many energy fields which we cannot normally perceive. Some energies have a spiritual source which act upon a person’s soul. However, this “soul” does not exist ab initio as orthodox Christianity teaches; it has to be brought into existence by a process of guided self-observation. However, this is rarely achieved owing to man’s unique ability to be distracted from spiritual matters by everyday trivia. This distinction reminds me also of the notion I recently read in a collection of Steiner essays, The Temple Legend amzn, of the Sons of Abel, or sons of God, and the Sons of Cain, or the sons of Man; those of Men to prepare the worldly and those of God to prepare the divine. To equate hermetic man with the one created divine versus the mosaic man who is divinely created but of the earth is like the dichotomy between the upright and inverse pentacles. One is spirit triumphant over matter, the other is matter triumphant over spirit. Both are necessary parts of the process of creation, or existence. The person that is developing a relationship with their divine self, whatever term one wants to use for that, and whether one thinks that that exists ab initio or is created through the process of communicating with it, either way this connection is made through developing a relationship; is a process by which one might be said to be remade from a mosaic into a hermetic being. Then, in combining the two ideas, I might suggest that to think symbolically is to be closer to divinity. It is the mythological level which is more divinely imbued and more divinely directed. This is, I think, to say something very similar to how practitioners of traditional chinese Feng Shui talk about Chi, and that the information form is more important than the physical form amzn. Further, therefore, allegory and symbol seem then to be the way the mind of the divine works. To understand even a bit of the divine is to understand art, poetry and music; to be touched by metaphor and myth; and to realize that all is metaphor, all is in flux; and, flux is merely the appearance of waves on an ocean too vast and deep to ever be fully comprehended.